This is the fifth article in the Chakras Series. It is about the fifth chakra – the sky blue chakra centered in our throat. According to Hindu tradition, the throat chakra also known as Vishuddha meaning purification, is the fifth primary chakra out of all seven chakras in the human body. The throat chakra is situated in the neck region near the spine with its superficial activation point in the depression of the throat. It is related to the ears and mouth due to its association with hearing and speaking respectively. The functions of the throat chakra do not only offer physical benefits, they offer mental and psychological benefits too. The following are the functions and benefits of the throat chakra. Physically, this chakra is associated with the thyroid gland and the human endocrine system, which is responsible for the release of hormones. The thyroid gland plays a role in releasing hormones that are important for growth and development. Also it regulates the body’s metabolic system, and is responsible for the proper functioning of the larynx, trachea, ears, nose, teeth, mouth, throat and the carotid arteries. When the throat chakra is blocked, you may suffer from many diseases and physical defects such as laryngitis, chronic throat defects, hypothyroidism, autoimmune thyroiditis, lack of motivation, fatigue, hoarse voice, cold sores, jaw pains, gum defects, headaches and obstruction in speech. Also you may resort to lying, gossiping and you will not be able to hear or deliver speech properly. The throat chakra is connected to self-expression, creativity, writing, listening to words and music, smell and taste. When this chakra is balanced, we speak and listen to people and what they have to say. After listening, we constructively respond with words and emotions. Communication is harmed when the chakra is blocked. In this case, some people overindulge in eating and drinking in order to keep the throat busy and thus avoid communication. Self esteem is also hurt, and dominant feelings might be those of anger and aggression, hate and bitterness. 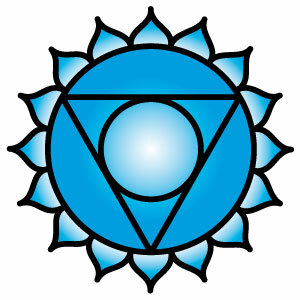 The throat chakra is also associated with the subconscious state of mind or the dream state. The chakra gains access to your dream state and allows you to see dreams clearly. When balanced, the throat chakra allows you to take responsibility for your actions, to be strong, courageous, and self confident. An imbalance in this chakra can make you feel that the world around you is hostile and you will expect aggression and violence from others. You will feel humiliated instead of feeling loved and nourished. Often when you’re dealing with a lot of issues and keep them inside, but also when you’re having some good feelings and keeping them inside – your throat feels stuck until the issue is cleared completely. You must remember, whether it is something negative or creative, you must be able to get it out of your body properly so that your throat chakra can get purified. Letting go is an effective way to clear issues. Simply acknowledge that there is an issue. Do not resist it. Just let the issue be. Allow yourself to feel the issue. And then, just let the issue go. Let it go. It might sound odd, but crying is a form of purification that can unblock your throat chakra. Often you feel a ‘lump’ in your throat and it might even cause you some pain, it is an indication that your throat chakra is blocked and you have to cry to clear it. Next time when you are sad, cry it all out. You will surely feel much better. Singing is very effective at cleaning your throat chakra so always sing your favorite song if you feel that it is blocked. Amazing Grace is a great song. Drinking some water can make your throat feel better. When you create something your work always reflects your intentions and thoughts so when you create, you communicate. Painting is a very good example of being creative. If you get a good neck and shoulder massage your throat chakra will surely open up. Place your hands on your collarbone and throat. Some practitioners say that for males, the energy is cleared by rotating left and for the females, rotating right. If in doubt, let your intuition guide you. Do what feels right for you. Visualize the blue sky and clear, blue water. The mantra ‘ham’ can be used to assist in clearing the throat chakra. It creates a vibration to alter the energy flow in the communication center. Some people prefer gemstones to clear their chakras. The throat chakra is associated with the color blue therefore; gemstones such as aquamarine, chalcedony or turquoise can be used. Aromatherapy can also be used where sage and eucalyptus are best to clear the blockages in this chakra. Once the throat chakra is balanced, you will be able to express your emotions with words at ease and you will communicate better. The mantra ‘ham’ can be used to assist in clearing the throat chakra. How do you pronounce “ham”. or like the latin, spanish way. haha! was just working on the throat this morning, its funny how these things come up! coincidence did not happened in advance! I book marked it. Interesting. In your experience, does a person often feel an aversion to things associated with throat chakra when it is blocked? For instance, the color blue. hi, i am 39 year old. I have started feeling as if how old i am. Recently I have diagnosed with thyroid . I am suffering with so many problems. please somebody guide me properly about thyroid and how reiki can help fully. Thankyou. Hi, I have very advanced thyroid disease, it can kill you, oh yes oh yes, and it often is associated with auto-immune disease(s)…I urge you first to get an experienced Endocrinologist, do not settle for less..then refuse to take the synthroid they give everyone, you are not an everyone you are a unique individual and it is poison to most people, you are at a bad place and you need to stop the physical medical process before it gets worse, and then work on what caused or contributed to it, like blocked chakras, poor diet, pyschological issues, the entire thing to heal totally, it is never just the one thing that cures or causes ,it is the gestalt of the situation, working with a gifted Reiki specialist is an awesome journey….but first, accept it ,be okay with the fact that you are sick, it is part of your journey and you have been given this mountain to prove that you can move it….then find a gift hidden in it like a pearl in that nasty oyster shell, I love to sing, I could only do Georgian chant really well, narrow range, but now that I have no thyroid sitting in my throat, I can sing absolutely anything, really, I found the gift, should have been careful what I asked for right LOL? Don’t worry everything will be amazing! Previous post: Reiki Training – What Does It Involve?